Group tracks are one of Bitwig Studio 1.2's headline new features. It must be the season for 'point two' updates. 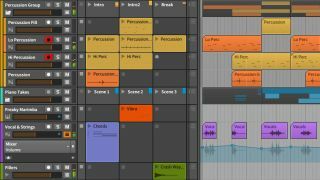 Last week, Apple gave us Logic Pro 10.2, and now Bitwig Studio 1.2 has entered the beta phase. Available to all Bitwig Studio license holders and scheduled for a full release in October, this is billed as the nascent DAW's most significant update yet. There's also the option to set up project templates and per-project controller mappings, as well as support for next-gen controllers such as the ROLI Seaboard and Roger Linn LinnStrument. Full details are available on the Bitwig website.